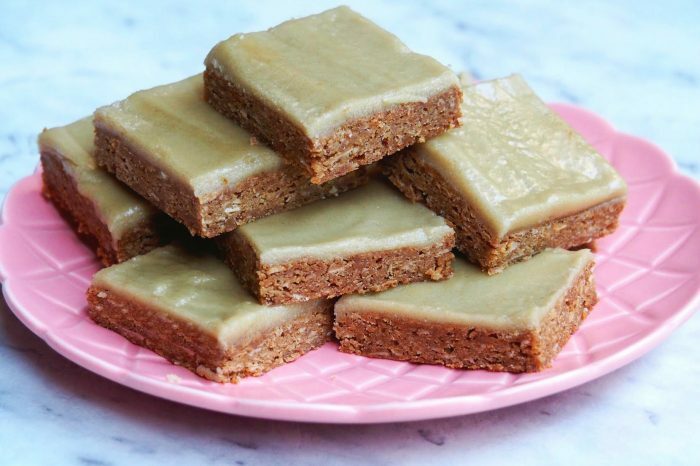 This is an oldie but a goodie and it’s one of the first Anzac delights I ever baked. 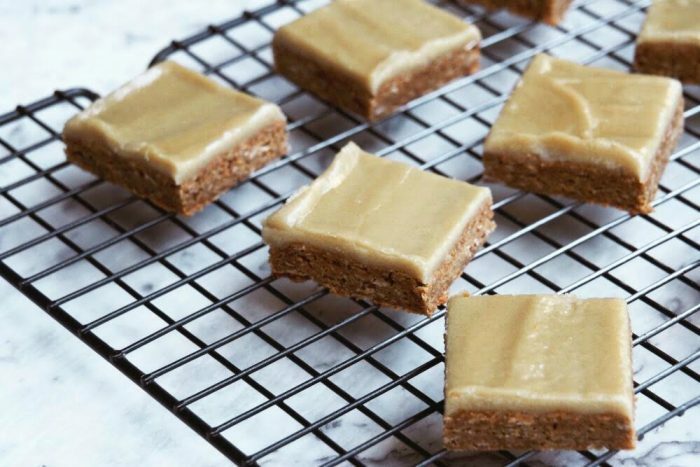 It’s the perfect tea time treat because it’s simple and cheap to prepare and uses just a few store cupboard ingredients! 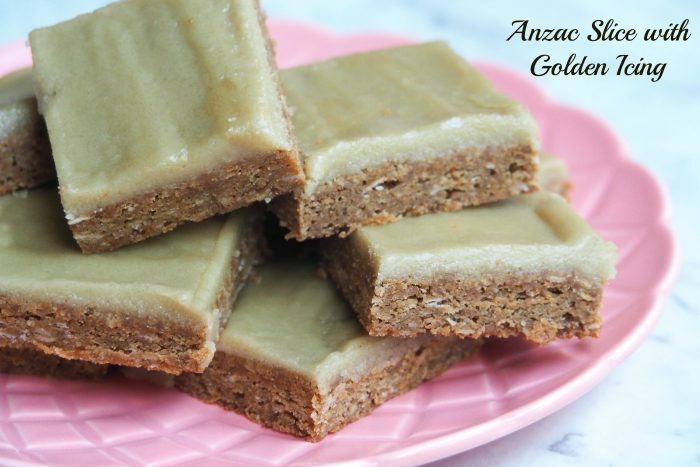 The Anzac base is the business, but that golden icing? Well, it’s just the tops. Preheat oven to 120 C/110 fan-forced. Grease 24cm x 32 cm swiss roll pan and line the base and long sides with baking paper, extending paper 5cm over the sides. Stir butter,sugar and syrup in medium saucepan over low heat until the sugar dissolves. Remove from heat. Stir in the combined water and soda. Stir in coconut, oats and sifted flour. Spread the mixture into pan and bake for about 45 minutes. Stand slice in pan 15 minutes before transferring to a wire rack to cool. Meanwhile, make the golden icing. Sift the icing sugar into a medium heatproof bowl, stir in syrup, butter and enough of the water to make a thick paste. Set the bowl over a medium saucepan of simmering water and stir gently until the icing is spreadable. Preheat oven to 120C/110C fan-forced. Grease 24cm x 32 cm swiss roll pan; line the base and long sides with baking paper, extending the paper 5cm over sides. Add butter, golden syrup/treacle and water to the TM bowl. Mix for 2 minutes at 70 degrees on speed 2 or until fully melted. Add bicarb and mix for 5 seconds on speed 3. Add remaining ingredients and mix for 1 minute on interval speed. Spread mixture into pan and bake for about 45 minutes. Allow to cool in pan for 15 minutes before transferring to a wire rack to cool. Meanwhile, make the golden icing. If using raw sugar, mill for 10-15 seconds on speed 9. Set aside. Add the butter and syrup/treacle to TM bowl. Beat at speed 3.5 for 15 seconds. Scrape down the sides. Add the milled icing sugar and 1 tablespoon of hot water and mix again at speed 3.5 for 15 seconds. Check the consistency of the icing, it should be smooth and spreadable. If necessary, mix again and add a few extra drops of water through the hole in the lid while the blades are running. Spread slice with icing. Allow to stand at room temperature for icing to set before cutting. TIP! If you want the slice to be fudgey in texture, decrease the baking time by 5 or 10 minutes. To store… Store slice in an airtight container for up to a week.